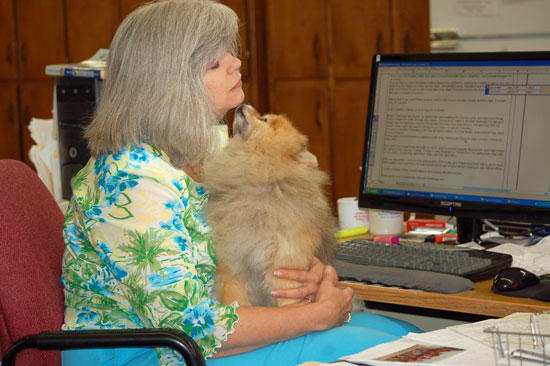 Cocoa gives a kiss to his "mom," Courier Advertising Director Teresa Stoetzel. Meet Cocoa, newspaper mascot dog. In a more formal introduction, meet Cocoa Puff, official “adopted” dog of the historic Cannon Courier that dates back to the 1880s in Woodbury. Historically, many American newspapers of old, both major and small town editions, had official newspaper plant “mascot” dogs. Traditionally, adoptees tended to be abandoned mutts that either strolled into a newspaper plant or was rounded up off the street by some editor, reporter or roving Linotype operator. The tradition fit most newspapers, because most publications crusaded for the underdogs of life, whether human or canine types. Cocoa, like many former newspaper mascot mutts, comes from a troubled past, having been orphaned by two past masters who perished in a car wreck and stroke respectively…thus ending up in the home and hearts of Bob and Teresa Stoetzel, who seem defenseless when it comes to sweet puppies. “When I asked Bob if we could take another child in addition to Honey, our princess dog already in residence, Bob said, ‘Is it Cocoa? Yes, of course,’” Courier employee Teresa noted. From the Stoetzel’s Woodbury residence, it’s a short distance to the Courier office. Like most newspaper mascot dogs with ink in their veins, Cocoa has already accompanied his newspaper family to Alabama to help tornado victims. Cocoa also has Courier co-editors ‘Uncle’ Tony Stinnett and ‘Uncle’ Kevin Halpern wrapped around his tiny paws, as evidenced by their creation of the dog’s fan club. “Cocoa needs a cool fan blowing on him when he sleeps in the afternoons,” Uncle Tony explained. “I think Cocoa needs to go outside with me while I take a break,” Uncle Kevin noted one recent deadline day of publication. Linotype operators of the 1930-1950 era were often themselves roving and homeless vagabonds, moving from town to town to the next local newspaper. One reporter at a Cookeville newspaper back in the 1970s was like those early Linotype operators, a vagabond who lived in his car, along with 12 newspaper mascot dogs. That’s the most mascot dogs I’ve witnessed at one newspaper office in my 45 years as a traveled journalist. At one newspaper of my youth, we had an adopted canine known as ‘Deadline’ that the employees took turns feeding and grooming. Dogs seem to hold special status in America, especially in sports. For example, there are more than 35 universities that have mascot bulldogs, perhaps the most famous of which is ‘Uga’ at the University of Georgia. Next time you’re in Woodbury, stop by the Courier newspaper office and say “hi” to Cocoa. You’ll be glad you did.